Fit Fluential Mom: Top 15 Tips for to Help You AVOID the Grocery Store, Save Money & Buy in Bulk! 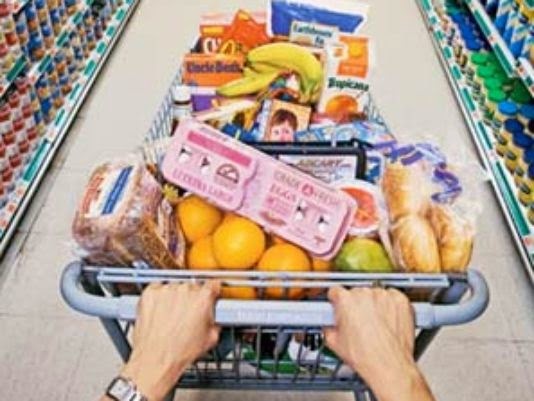 Top 15 Tips for to Help You AVOID the Grocery Store, Save Money & Buy in Bulk! How many people LOVE going to the grocery store every few days? I know I DO NOT! I like going, don't get me wrong, but no more than once a week or once every two weeks if I can help it! So, below are my tips for avoiding grocery shopping more often than once every week or two! Give them a shot and see if you can make life easier on yourself! This is especially for the hard working mamas and dads out there! One tip....If you have the room, get an extra refrigerator! We bought one second hand off a resale group on Facebook and it is a life SAVER! Or, at best, an extra freezer! 1. 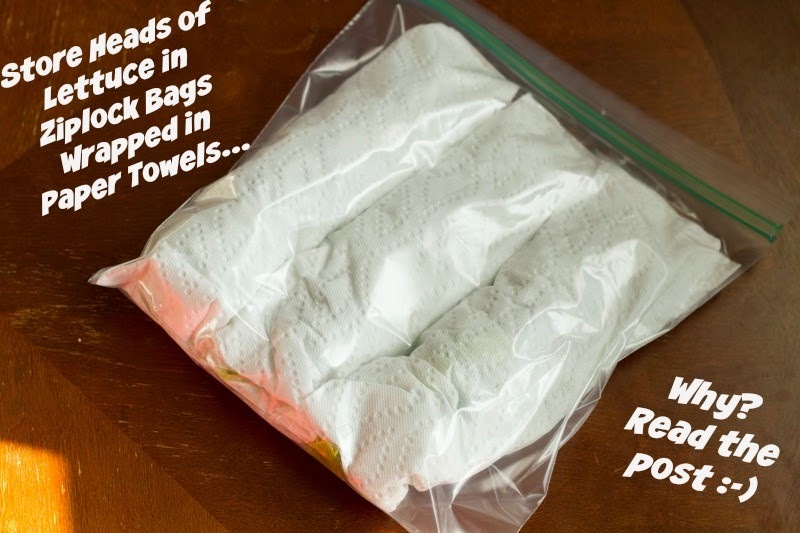 Wrap lettuce and spinach up in paper towels, then place into a zip lock bag. It'll last at least a week, sometimes 2 weeks, without wilting. Wash it when you're going to use it so you don't add extra moisture before storing it. 2. Buy cheese when it's on sale and freeze it. I buy 2 - 4 lbs of skim mozzarella cheese at a time. I have the deli cut it and put it in individual 1lb bags. If I buy it at Costco, I separate it into 1 lb bags, keep 1 lb in the fridge and freeze the rest. 3. Apples, pears, oranges, grapefruits, plums, grapes and nectarines will stay fresh in your fridge for at least 2 weeks. If you put them out, they'll be ready to eat in a day or two. 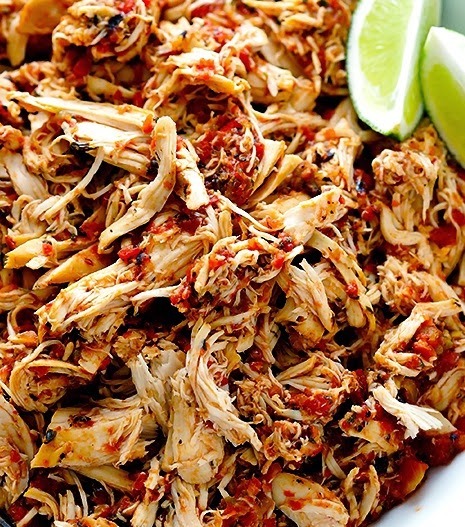 So, buy in bulk, store most of it in the fridge, and leave only a few pieces in your pantry to have ready to eat. 4. When chicken is on sale, I buy about 20 lbs worth of it. I have the butcher separate them into 5 lb bags and freeze them that way. When I make the chicken, I make 5 lbs at a time so I can have enough for dinner and enough to prep and also have some more on hand for the week. 5. We don't eat a lot of bread by my husband and daughter take a sandwich for lunch most days of the week and they occasionally have toast. We buy the 2 loaf pack at Costco and store it in the fridge. It stays good for at least two weeks, sometimes more. 6. When it comes to fruits, berries are my favorite. We buy frozen berries for our shakes and our oatmeal because they are organic and a lot cheaper than the fresh variety. They also last A LOT longer than fresh berries, which tend to only last a few days. We also buy frozen mango for our shakes and it makes them thicker and more like ice cream too! 7. For snacks, we like to have almonds, string cheese, roasted peas, dried cranberries & whole wheat crackers on hand. All of these can be purchased at Costco and keep well. They'll last at least 2 weeks in your fridge or pantry. 8. One of my favorite snacks is baby carrots! I buy the large 3 lbs bag at Costco. They're organic and also last about 2 weeks, or more, in your fridge. I leave the bag in the fridge or take them with me to work in small zip lock baggies and snack on them throughout the day. 9. Milk! One of the items that most parents have to go to the store every other day for! Have you ever noticed that organic milk lasts A LOT longer than non-organic? I buy organic milk and I buy 3 - 6 half gallons at a time. That will last me at least 2 - 3 weeks and the expiration is usually at least a month or a month and a half out so I have plenty of time to use it before it expires. 10. Deli meats! We take our lunch to work each day and my daughter takes her lunch to school. With that said, we buy a lot of nitrate free deli meats. When we buy it, we buy 2 - 3 lbs at a time, sometimes 4 and it can last about 10 -14 days in the fridge. 11. Bananas! We eat a LOT of bananas! We buy them as green as we can and when we get home, we separate them and leave them out. 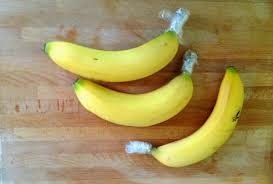 By separating them and wrapping the stems in saran wrap, you give them an extra few days of life before they brown! We buy about 30 bananas and they tend to last us about 10 days without going bad. If we see they're going bad, we freeze them and just add them to our Shakeology or oatmeal frozen. 12. Eggs! We buy the 60 count eggs at Costco. I use the eggs for omelets for myself and I hard boil a lot of them so I can keep handy in the fridge for a healthy snack. 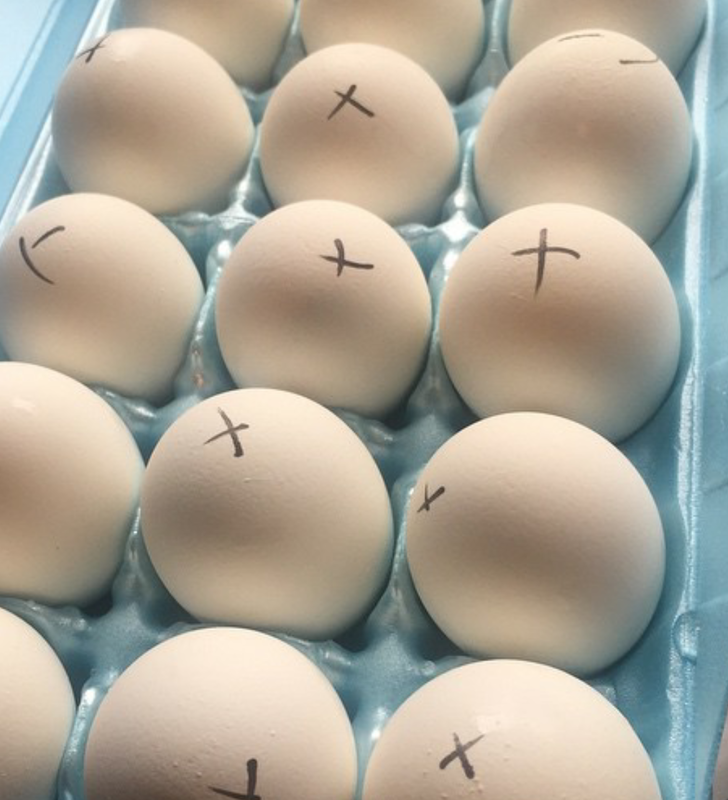 I put an X on top of the hard boiled ones so I know which ones are ready to eat! 13. Cottage cheese and Greek yogurt! We eat A LOT of this. If you buy the large containers of it at Costco, you can save money AND they last about 10-14 days in the refrigerator. You can separate it out into small plastic containers to have handy and ready to eat in portion controlled sizes in the fridge or take to work with you! 14. Cereal! We eat cereal more like a finger food than a breakfast here. What I do to prevent it from going bad is I store it in plastic containers with a lid. This way, even if they last a month or more, they are still fresh and taste great because they are kept in an air lock container. And I don't buy containers, I use the ones that the mixed nuts come in from Costco! 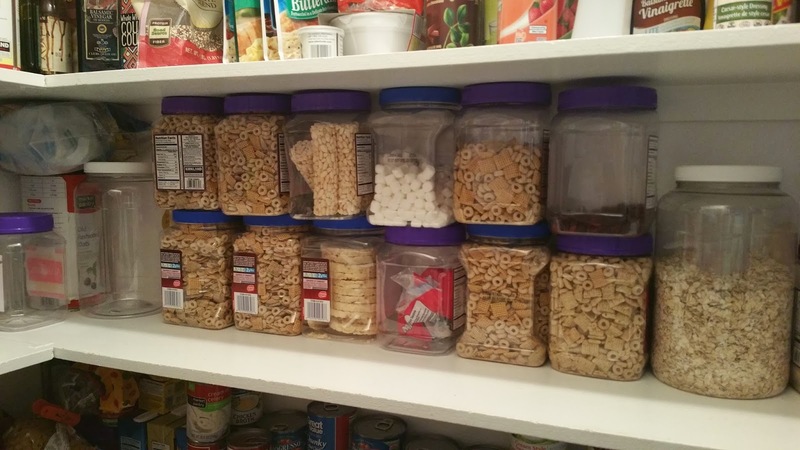 So, I buy a lot of cereal at once and I blend the flavors, then put them in the containers. I buy one box of a sweet type of cereal (honey nut cheerios or Cinnamon Puffins) and blend them with a non-sweetened variety so the kids get a little bit of the fun flavors without too much sugar! 15. Veggies! 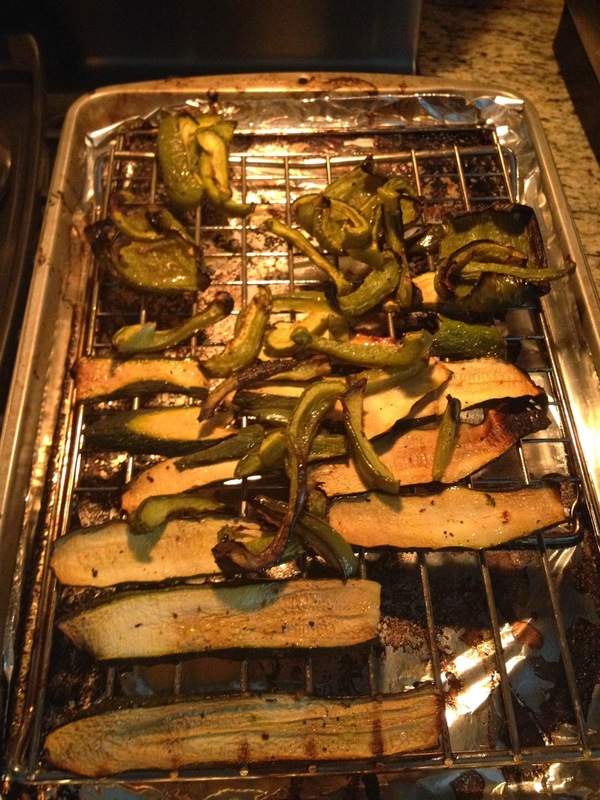 Veggies can go bad pretty quickly! I buy them when I know I'll be using them for dinner that week and, if I don't end up using them, I cut them up and use them as snacks that week so I don't waste food. I also like to buy the frozen Normandy Blend variety at Costco. 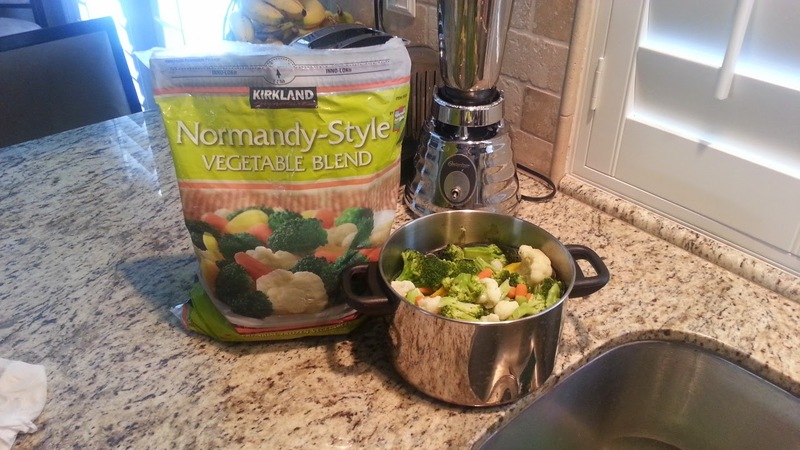 It comes with broccoli, cauliflower, carrots and squash and our family enjoys it as a side dish with dinner often. I also eat them as a snack throughout the day so I make some and keep it ready to eat in the fridge! So, those are some of my tips for avoiding the grocery store more than a few times a month! Do you have any tips to add? If so, I'd LOVE to hear them! Add them to the comments below and I'll add them to the blog post with your name below them!